I wrote an article yesterday that described the energy loss of particles because of their rest masses. That is, what energy is not available to further kinematics. (Since we do not understand from where mass comes from we also do not understand how this rest mass is responsible for any particle reaction.) SO far we had been assuming an absolute zero mass for photon which gave it a constant speed of c. In the follwoing article I considered a value of photon mass which is known from experiment but is not taken for consideration for best value of photon’s mass (by PDG: 10^-18 eV). I will calculate for this best value and we will see what it means for OPERA’s results. I have also written another article about a month ago which described in what limits of precision we should see these results, quantum mechanics gives us from it’s own theory and practice the best estimates on achievable precisions. delE = 10^(-7) eV, this gives a delT of 0.4136 nano-seconds. 2. Energy loss = sqrt(2*E*mcc); E = total energy, mcc or m in units of eV is rest mass or rest energy. For brevity I consider 10^-7 eV gives 0.5 ns SO an order of magnitude more in energy precision that is, 10^-8 eV this is 5 ns and for 10^-9 eV this is 50 ns. That is an energy loss or gain of (10^-9 – 10^-8) eV = ~ 10^-8 eV corresponds to 5 – 50 ns. It is in this time precision range where the OPERA results have any meaning. I make one change to 2. Instead of the value 10^-7 eV for photon mass I take it’s best experimental value of 10^-18 eV for all calculations in this article. 1. The photon mass is much smaller than even 10^-18 eV. WE need far more precision is doing this than perhaps WE know so far. eg there is an anomaly value 10^-26 eV in that situation you will see the analysis I am going to make further from here can not take away the advantage of photons in claiming speed c.
2. the present value of photon mass of 10^-18 eV is indeed the most precise and correct value, that is it is as precise as say the well known particle masses. In that case a much better energy precision than with which “10^-8 eV photon mass is known” is needed to see if neutrinos cross the speed of photon or not. But since uncertainity priniciple plays it’s role we can not demand better energy resolution at the given time resolution, hence another kind of experiment may have to test the speed. It will be perhaps indirect. NOW back to the analysis of this article considering energy loss formula stated above and a photon mass of 10^-18 eV. 1. at 17 GeV and photon best value 10^-18 eV photon energy loss = 18.44 x 10^-5 eV which is much larger than 10^-8 eV hence photon can not claim highest speed. 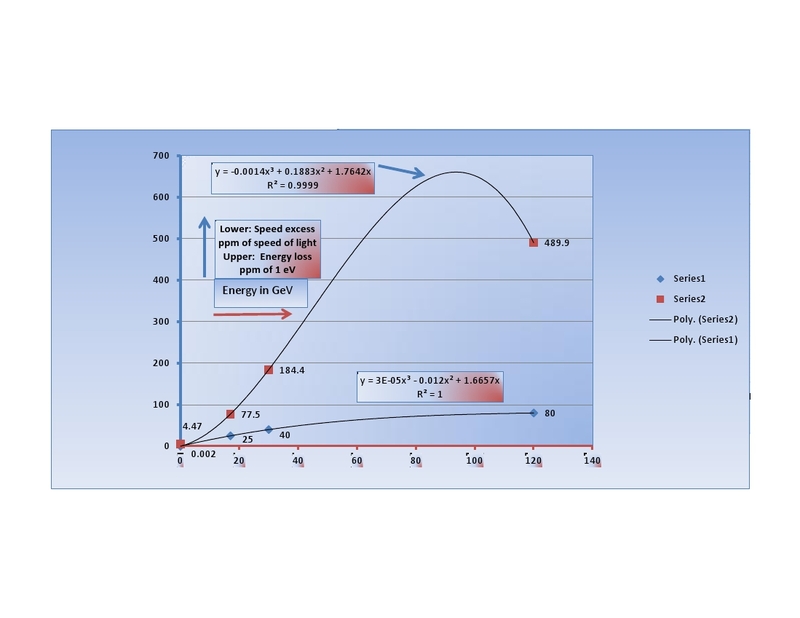 2. at 3 GeV photon loses 7.75 x 10^-5 eV, hence photon can not claim highest speed. 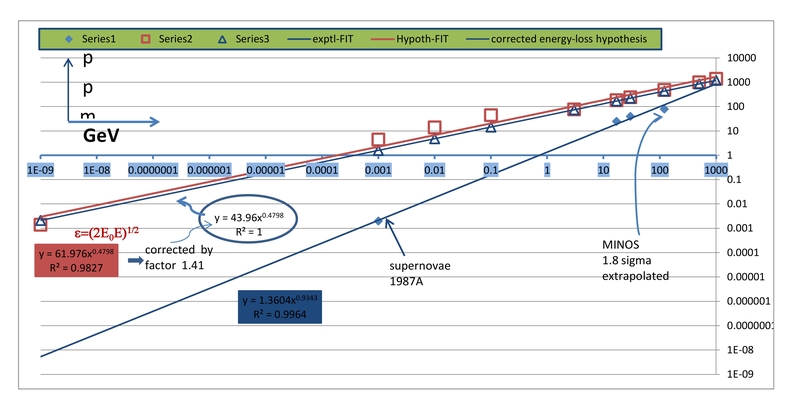 3. at 10 MeV photon loses 4.47 x 10 ^ -6 eV hence photon can not claim highest speed. Notice that this energy loss comes to a desired level (that is within the error of 10^-8 eV, hence acceptable) at even “1 eV total energy” of photons, with photon mass of 10^-18 eV. Hence WE have a handle from 1 eV to any higher energy. (But 1 eV is too small an energy, also this is the mass-level of neutrino) NO other particle has this characteristic. I should also calculate for 3 GeV what is the loss in photon’s energy. NOW I will plot these results in comparison to the experimental (and some points were extrapolated**) speed excess curve I had obtained. ** the extrapolated point may be a reasonable data but for now no claims except where it is positioned. I will take the Y-axis for these results to be a loss of energy of photon in parts per million of 1 eV of photon energy and plot against total energy in X-axis, so you will see why a larger loss of “ppm energy” (than the precision we have of 10^-8 eV in energy and “zero” photon mass) is hinting towards a neutrino speed excess consistent with each other. If the energy loss for photon was not a problem we would have other reasons to look for the speed excess anomaly. I will post a logthm sometime so you will see the zero-level clearly. Here I have a zero fitting but for our purpose does not matter. Also the exact fitting functions do not matter for now and there is much physics there as well.